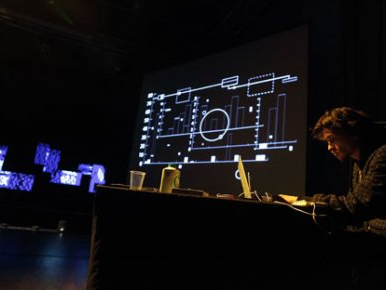 Marko Batista initially perceived space as a programme; lately, however, he is increasingly constructing it as a whole and site-specific situation, which he generates by means of a hybrid interweaving of electronic, mechanical and digital objects. 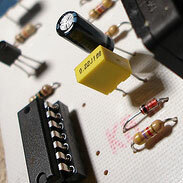 For this purpose, he is developing graphic modular programme junctions, which he links with sound modules. He does not trigger direct narrative associations with his visually acoustic space; rather, he explores the phenomenology of audiovisual information by immersing the visitor in the acoustically visual ambient, which produces sensory, mental and aesthetic reactions. 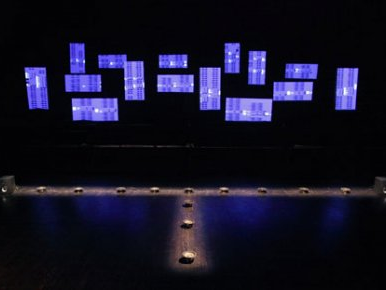 The principal subject of his latest work entitled H220 was a multichannel sound intervention into space, whereas this time – in contrast to galleries, which hosted the majority of his installations – he is going to offer his viewer a different perception of sound within the theatre space. 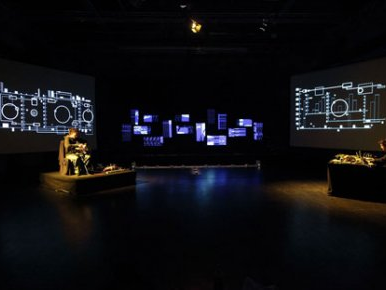 With each work, the author sets himself a challenge in terms of a theme or a motif: in Hybrid sound-mechanical machines (Hibridne zvočno-mehanične mašine), for instance, he took as a starting point the electronic vibrations of neon lights and special hybrid elements; in Error Trash and Parallel Digital Structures , fragmentations of media images and contemporary transmissions of tele-signal function as the starting point; and in Magnetic Matrix 3.1, the tracking of the material properties of ferrofluid in oil performs this role. 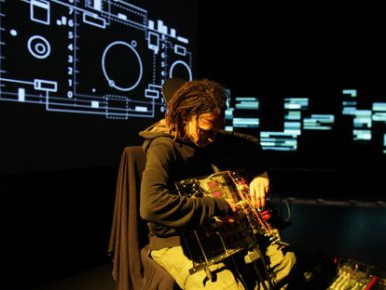 In Timing Diagrams, he will perform, for the very first time, the entire sound image without digital sound manipulation with a specially designed mechanical-electronic device, which is reminiscent of a futuristic musical instrument and which was designed specifically for this performance. In the performance, Batista will emphasise the role of visual structures, which will be determined by various temporal coefficients, intertwined into peculiar rhizomatic structures. He will project the image on two side-screens and on the central video mapping, which will show the fragmented image on several smaller video surfaces. 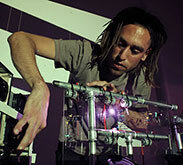 The artist is interested in the interaction of parallel sound modules, which trigger unpredictable visual effects. The spectator cannot logically reduce the relations between the production of sound and its visualisation, because breakdowns and glitches constantly appear in the linear flow of sound and image. For the act of viewing, a certain intellectual effort is expected, and this effort is constantly transposed from the rational to the sensory level and vice versa by the breakdowns and glitches. In addition to the video areas, the visual space will be composed of rotating electromotors, which will respond to commands from the sound instrument, which is how the author is going to produce a visual relation between three temporal diagrams: between the electronic, the mechanical and the digital retina. 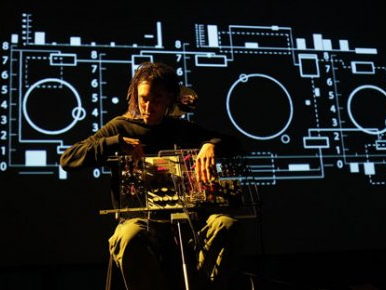 The author is primarily interested in the structure of the performance and in the theoretical explorations of hybrid connections between electronic circuits and spectral data models, and he does not emphasise merely the aesthetics of sound or image, albeit these two elements are not insignificant. 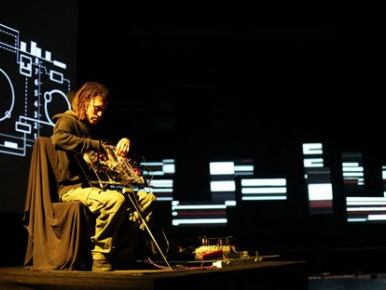 We can recognise his typically reduced visual aesthetics, whereas in the audio-field, he makes use of a broad spectrum of sound elements, from expanded sounds and glitches to more or less intense noises and sounds, which are bound to physical space. Each work is determined by a precise sound score, which is how the author draws a clear line between compositions for specific works. 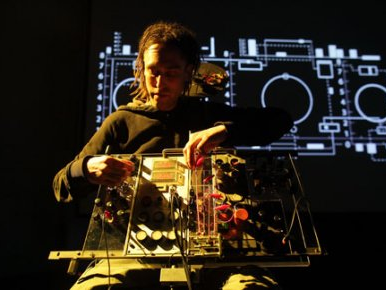 As regards the construction of sound instruments, he is interested in the inventor’s approach, which makes possible unpredictable alchemistic fusions of various types of matter and it enables the networking of mechanical and electronic devices and digital applications. For each project, Batista envisages open form, which, in subsequent reprises, allows modification, similar to open-coded programmes, which are closed in themselves, yet, they allow variations, upgrading and changes of user interfaces.